We recently heard about this guy who dressed as a pretty great pirate for Halloween last year. He wore the eye patch. The striped shirt. The wave-ravaged clothes. He even smelled of the sea. He had the perfect hat, and even brought a live parrot to the party, whom he’d taught to say “Land, ho!” and “Ahoy, mateys.” But he wore loafers. LOAFERS for crying out loud. Do NOT be this kind of pirate. Pirates do not wear loafers. Or sneakers. Or desert booties. Or moccasins. They wear boots, folks. 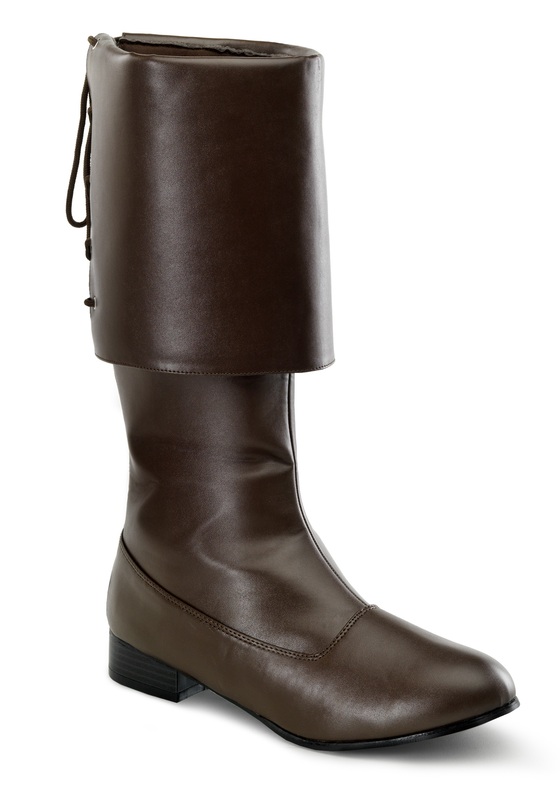 Beautiful Brown Buccaneer Boots, such as these. In our opinion, if you can take the time to invest in a trained parrot (do you know how long parrots live? ), you can take the time to find the right footwear to accompany your Halloween costume. After all, everyone knows that wearing anachronistic or inappropriate shoes is a clear amateur move. So don’t let us catch you in your Chucks or slip-ons or...shudder...socks and sandals. It’s boots for you, swashbuckler. Or you’ll walk the plank.